Hooray! At long last I’m pleased to share my latest pattern, the Patchwork Llama Pillow! I designed this little fella last year when my Juxtaposey fabric collection came out. Life has just been a crazy whirlwind ever since (ok, it was before that too) and I can’t believe a full year has passed. But better late than never and good things come to those who wait, etc (Insert your favorite procrastination saying here). The Patchwork Llama Pillow is a fun project to make using a variety of fabrics. 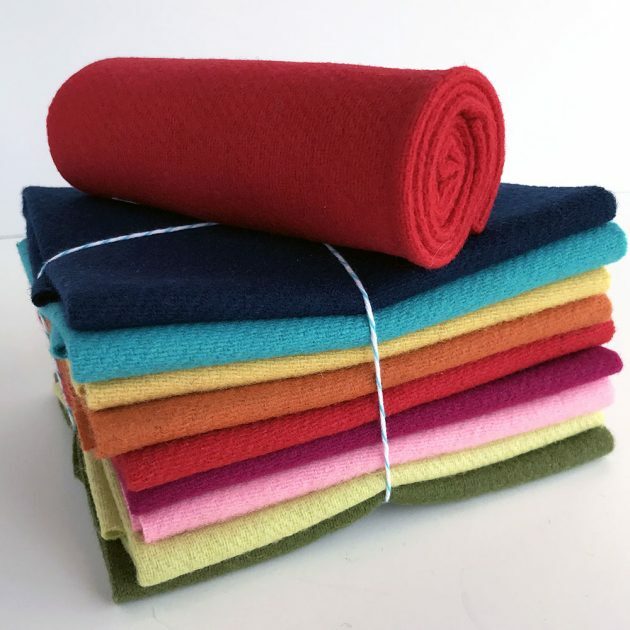 Choose vintage scraps, 2 ½” wide “jelly roll” strips or mix your favorite quilting cottons with brightly colored wool solids. You can accent your llama with extra details such as embroidered elements or yarn-y ear tassels and pompoms. The pattern is available in my shop, as well as “fat 16th” stacks of Justaposey cotton and yummy bright wool solids , if you’d like to create one like mine. 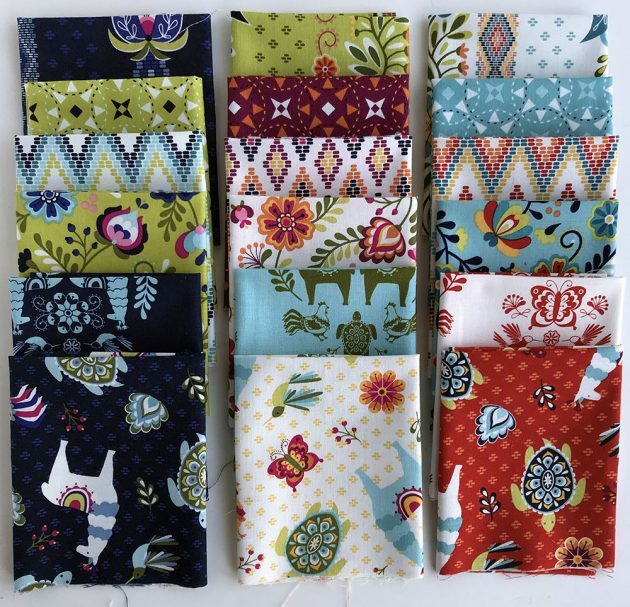 I even put together some stacks of my earlier Dutch Treat fabric collection. Each stack has the full collection of 18 prints, measuring 9″ x 11″ each. You can find them in my shop as well. Juxtaposey! This is what the sample above is made with. Let me tell you about this delicious wool! It’s a melton wool (woven, not felt!) from Riley Blake. I curated the color palette to coordinate with Juxtaposey, but guess what? Most of the colors play nice with Dutch Treat as well. 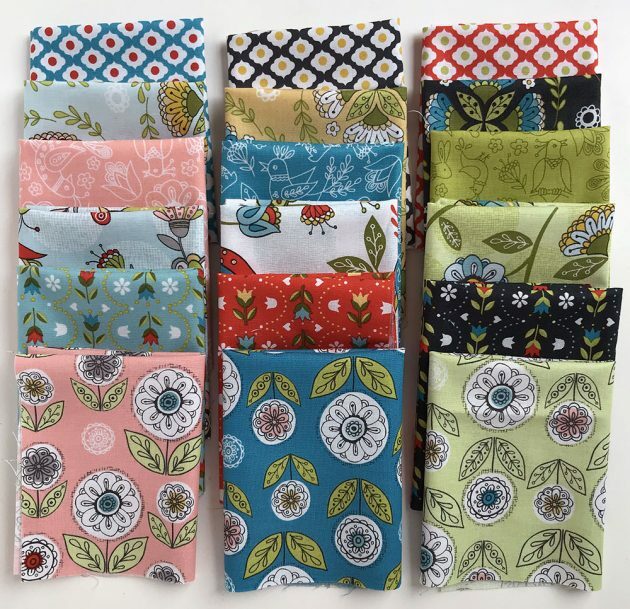 This bundle has 9 different color “fat 16ths” each measuring 9″ x 11″, plus a bonus “fat 8th” (9″ x 22″) for the side strip of the pillow in either Scarlet or Turquoise. Yummy! I hope you’ll join in the fun! If you haven’t already, please join the School of Wool Facebook Group. I may get brave and do a Facebook Live video over there during the Llam-along. 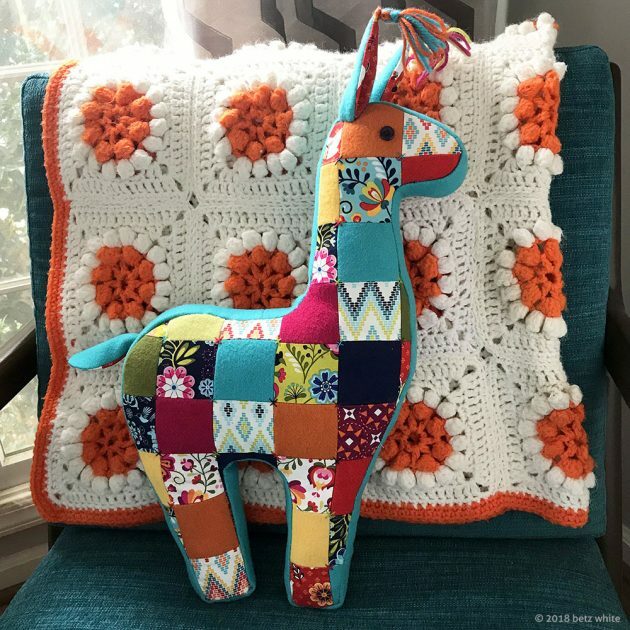 Post your finished Patchwork Llama in the Facebook Group or on Instagram with the tag #betzwhitellamalong by April 15th to be eligible to win a prize! I’ll choose one winner to receive a mystery surprise pack from me! Let me know if you have any questions in the meantime! You have such a good eye. Both the Juxtaposey and the Dutch Treat collections (and the wool pieces) are fun and beautiful. Cute llama!